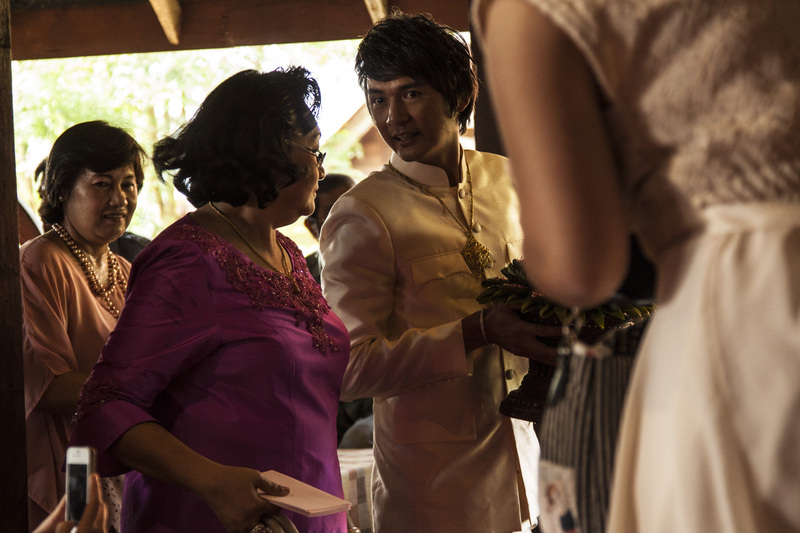 This past weekend I had the awesome opportunity to attend a traditional Lanna style wedding. Thailand’s relaxed and go-with-the-flow attitude, and unofficial national motto mai-pen-rai (meaning no worries), was more than evident when my co-worker approached the Urban Light team and announced that her sister and sister’s boyfriend, who had been dating for nine years, had decided to get married in three weeks! Of course we all accepted the invitation, as we were all excited to get into some traditional Thai threads and see how a wedding could possibly come together in a matter of days. I headed to the Warorot market a short walk away and negotiated a price on a green, heavy, 100% traditional Thai silk shirt (still questioning the silk content) and fisherman pants (which are quite airy— I’m thinking about buying a few more to wear to bed at night). Me and Marissa, another UL volunteer, with Aw who graciously invited us to the wedding. The day of the wedding came, me nervously waking up a half hour before my 7:00 alarm (I actually set two just in case my body resisted after a Saturday night). A song-taew arrived at 8am to pick up the nine members of the Urban Light crew, and off we were (nearly ten farangs in traditional Thai dress is definitely not a regular sight for our neighbors living on our soi, or side street). When we arrived, we entered the space where the wedding would take place and were greeted by the bride and groom, both receiving us with a wai which we all returned. The dress and suit of the bride and groom looked great! I’m thinking of grabbing one of those suits before heading back to the states— goodbye wool sports jackets, hello silk! The energy in the room was very high, especially for a 9:00am wedding. Our group was the first to take a seat on the mat-covered floor. We all sat, having to adjust our legs occasionally as none of us has yet to master the comfortable Thai ways of sitting. Family and friends of the bride and groom sat in chairs and benches around the matted floor. We must have been entertaining to watch, as all eyes seemed to look over and smile with curiosity at the farangs on the floor. Maybe it’s just a feeling I have that still comes over me when I walk into a lot of the local markets and stores where farangs aren’t normally seen. The feeling is starting to fade as I learn more Thai and get used to the everyday customs of the locals. Overall, everyone in the room seemed very relaxed and jovial, far from the attitudes of many I have seen attending western style weddings in the states. Weddings, something I usually loathe for the sterility sometimes accompanied by them, did not exist here. Many people were dressed traditionally, others not, but the important thing was that we were all there to celebrate and enjoy the day. Other wedding guests in the pavilion. 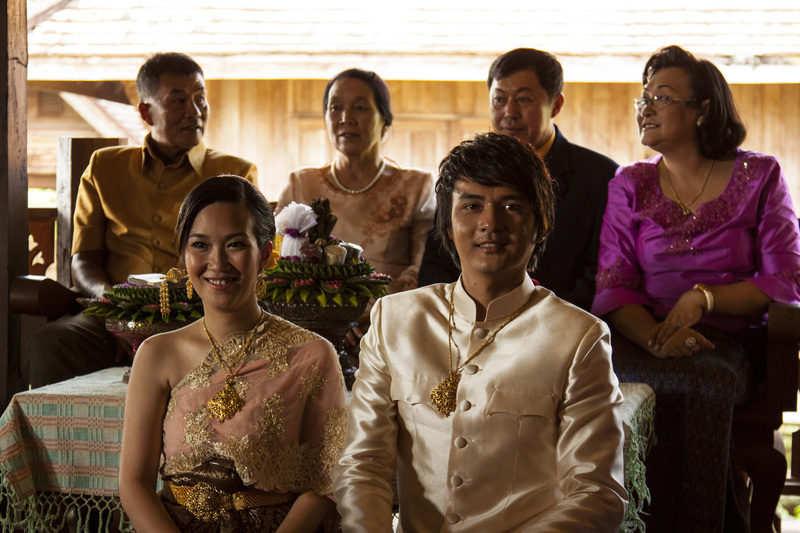 The name of Lanna Wedding, “Kgin-Khaek”, literally indicates the Thai meaning. The word of “ Kgin” is equivalent to “eat”. 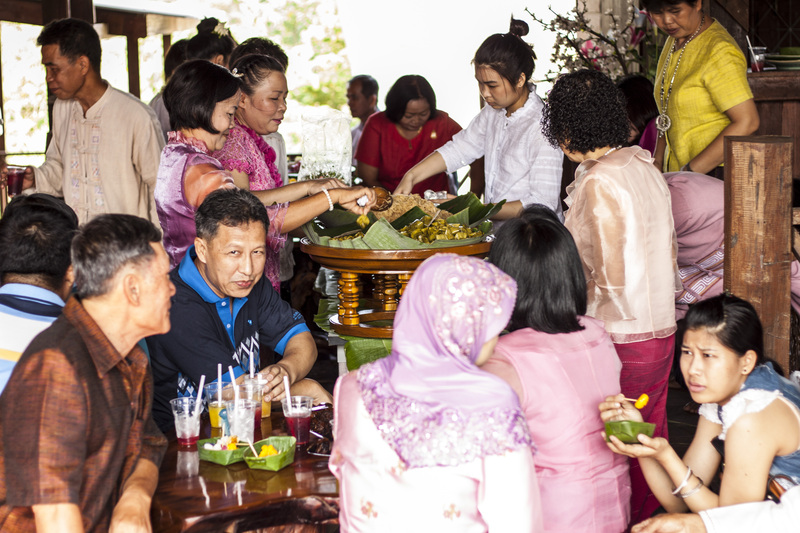 It shows that Thai society is based on eating or food culture. “Khaek” means visitors or guests. (Incidentally, this word in modern usage has been applied particularly to Indians, Muslims, or Arabians who happened to migrate or visit Siam.) When the two words were put together, it meant the guests were invited to dine at the social gathering of a newly wed couple. And eat we did! Food was available all throughout the wedding ceremony, and conversations and eating were free-flowing during the whole process. I sheepishly went up for seconds and thirds— must be that MSG bringing me back (SO GOOD)! LIttle did I know of the full lunch that would be served later on. We were encouraged to keep eating, and yes, I happily obliged. Food being served. Noodles and a variety of desserts started us off. A simple noodle dish got us started. 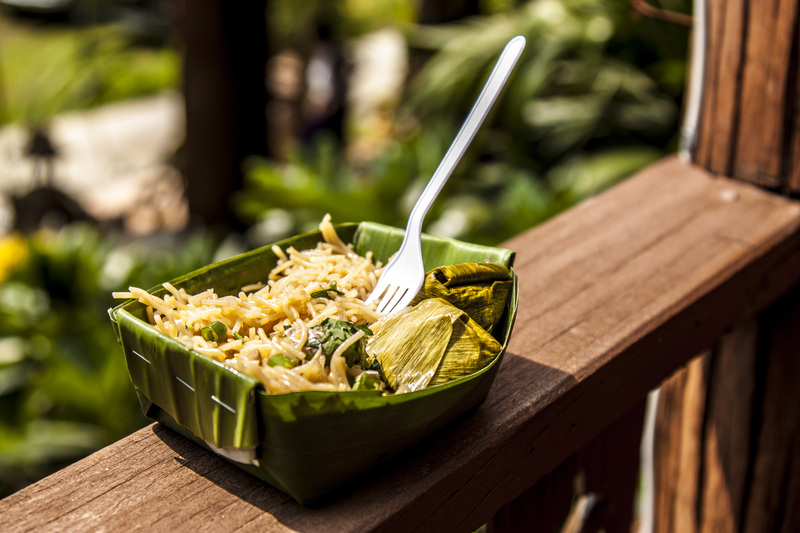 Loved the sustainable banana leaf bowls! At the beginning of the wedding, the bride awaits the groom as he passes through friends and relatives and finally to the parents of the bride. The bride’s parents and grandparents sit next to her as she waits. It was so nice to see how much the family is involved in the ceremony and the affection they showed to each other throughout the whole process. The bride awaits her groom next to her grandparents. Only when the three stages of “gatekeepers” allow the groom through will the ceremony begin. There wasn’t much resistance, as it seemed everyone was more than comfortable allowing him through. Everything from belts to necklaces were off of guests, blocking his way to the bride. A small amount of money “bribes” the family and friends to let the groom and his parade march through. The groom then presents the bride’s parents with a dowry (stack of money and perhaps other gifts) and makes a public promise that he will be faithful to and care for his bride to be. Additional gifts of gold are presented to the bride. I was a bit confused of this “gatekeeper” parade happening outside, but the involvement of everyone in the ceremony seemed like a lot of fun. Having the groom’s mother accompanying the groom, a complete reversal of western wedding traditions, was refreshing to watch as well. The groom on his march towards his bride. Groom accompanied by his mother at the end of the “gatekeeper” parade. Inspection of gifts. The groom made it! 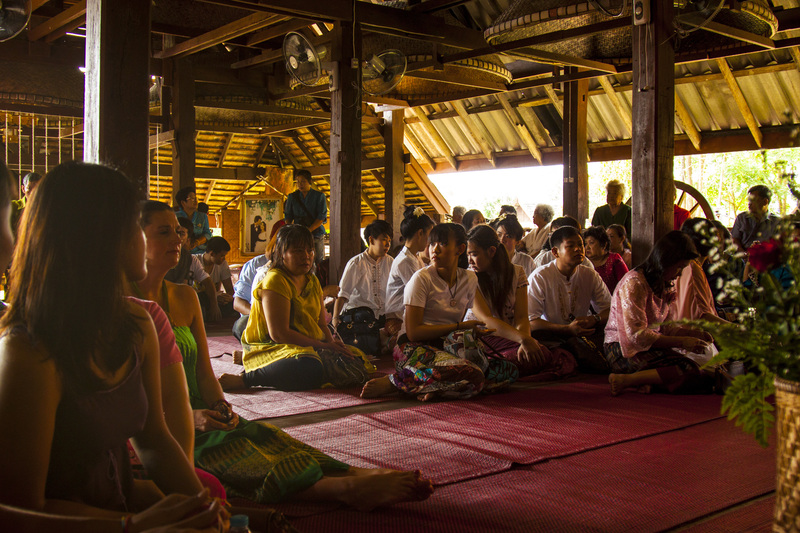 A village elder who once received monk training officiates over the rest of the ceremony called the “pook kor mue” or cord tying ceremony. He ties together the couple’s wrists and paints three dots on the bride and groom’s heads, symbolizing an offering to monks made earlier in the day. 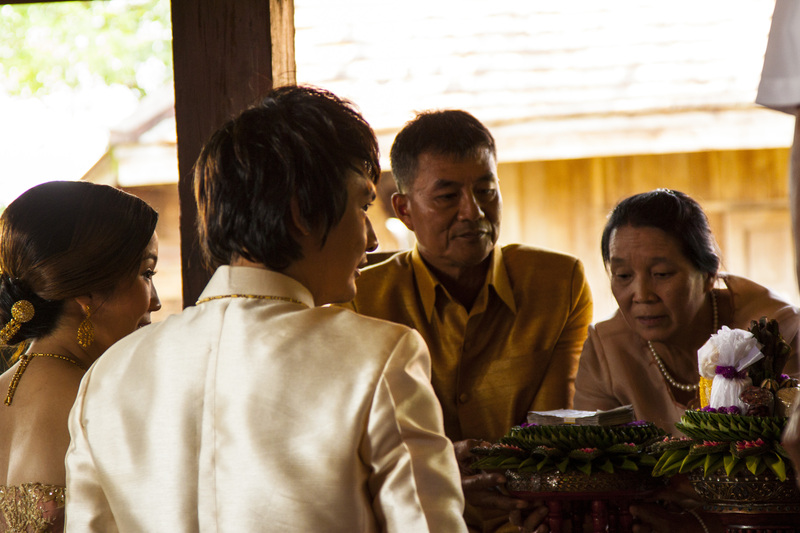 After he completes a set of readings, the village elders and grandparents continue the pook kor mue by tying cords around each of the couple’s wrists and imparting their wisdom to the newlyweds. This continues with family and friends. While this was all going on, the rest of the wedding guests ate, drank some delicious infused teas and other beverages, and carried on with conversation. The whole ceremony lasted about 45 minutes. Painting the three dots on the bride’s head. Bride and groom untied by the cord tying ceremony. So many good wishes tied onto this couple! 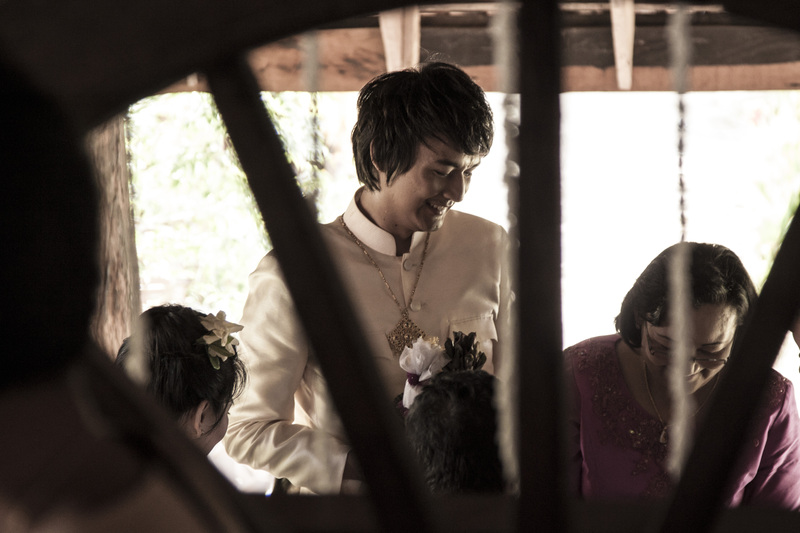 After the pook kor mue is over, the couple is escorted to their nuptial bedroom, which is decorated with flowers and items that symbolize fertility and prosperity. Sometimes there might already be an old Thai couple sitting on the nuptial bed, waiting for the newlyweds to arrive. The Thai people believe that an old couple is evidence of long, successful marriages and often, the old couple imparts their good luck to the newlyweds in different ways. The end of the wedding ceremony is marked when the newlyweds sit together on the bed, thus symbolizing the beginning of a life together. We end the ceremony just a little differently back home! When the bride and groom returned, everyone spent about an hour eating a prepared meal while watching some great traditional Thai dancers do their thing. 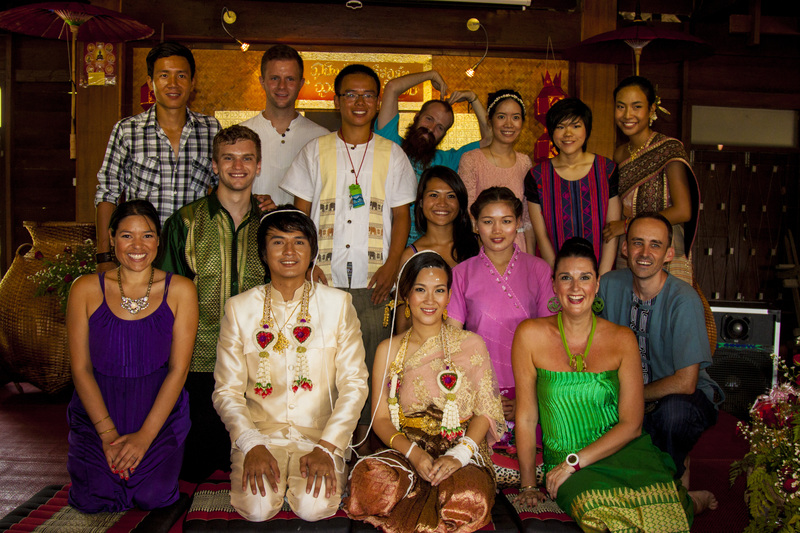 And so concluded my first Thai wedding in my first month abroad! It’s unlikely I’ll see anymore and I doubt wedding crashing is a viable option to attend more, but I’ll still have my new threads to show off back home. Perhaps silk and fisherman pants will be the next big thing in the US! I feel very privileged to have been able to attend this ceremony— being invited to someone’s wedding that I had never met and being treated as family while there really sums up the generosity and values of the Thai people day in and day out. As I learn more Thai and become more comfortable with the ways of the locals, I get more and more a sense of belonging here. I know it’s only been a month, but I have a lot of room to grow as I incorporate myself more and more into this wonderful culture. Our group took a turn taking a picture with the newlyweds! This entry was posted in Culture and tagged Bride, Groom, Lanna, Lanna style wedding, Thai culture, Thailand, Urban Light, Wedding, Weddings by ejglotfelty. Bookmark the permalink. Thanks for checking it out! It is truly a wonderful experience and privilege to be here. Best wishes, John!